UPDATE: The Excel file below has the definitions in English also. Ua tsaug Zoo Tsua thiab Ntxhais Hawj vim neb tau pab txhais. 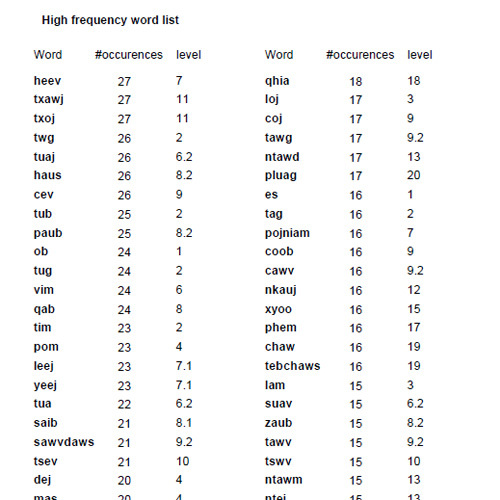 This high frequency word list was originally developed by Yves Bertrais, a french Catholic missionary who also helped develop the Hmong written language as well as one of the most comprehensive Hmong- English dictionaries ever made (sorry, it’s in French). The original pdf contains a few extra pages of other information (frequency of vowels, consonents, etc.) Go a few pages down to start seeing the words. They are in order of frequency and there are 432 in total. I have also put together an excel file of just the hmong words. There are many activities you can do with this pdf… You can use it as a test of how much vocabulary you have already learned. You can use it as a basis to create activities to help you learn the most important and common words. Be creative!